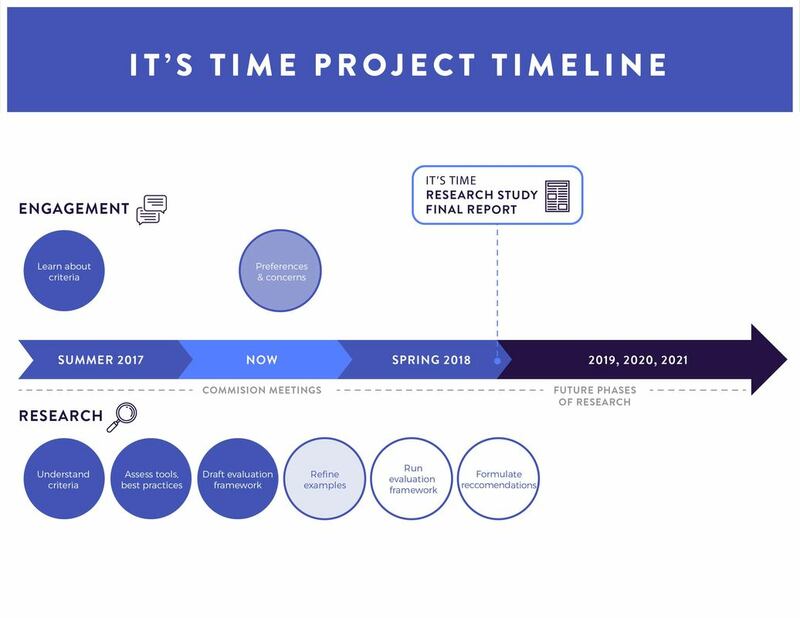 What is the It's Time project? The It’s Time project is a public engagement and research initiative led by the Mobility Pricing Independent Commission to explore decongestion charging as part of a plan for the future of transportation in the Metro Vancouver region. The project is designed to research and gather information about decongestion charging including learning about how charging has worked in other cities, and hearing from residents and businesses about what decongestion charging means from a local perspective. The It’s Time project team is made up of technical experts and a public engagement team that will be researching and gathering public feedback on ways to reduce congestion in our region, while exploring a system that promotes fairness for all users, and generates revenue to support new and improved transportation infrastructure in the region. ​Decongestion charging is a form of mobility pricing where users pay for the road services they use. ​This can include paying a small amount to use a road during more congested times of the day, or paying per kilometre traveled in a car. The It’s Time project will be exploring decongestion charges associated with the use of roads and bridges. This may include options like fuel taxes, vehicle levies and insurance premiums, charges to use the most congested roads and bridges, and per-kilometre fees. Decongestion charging is used in major cities around the world including Singapore, Stockholm, and London to reduce congestion, improve travel times, and generate funds to reinvest in new and improved transportation infrastructure. ​Learn more about decongestion charging. Mobility pricing refers to the variety of different ways we pay for using our transportation system. It includes decongestion charging, as well as charges for car sharing, bike sharing, ride sharing, parking fees, and transit fares. Why is Metro Vancouver looking at decongestion pricing now? ​Our region is growing, with more people and goods moving on our roads and bridges than ever before. A recent Ipsos Reid poll showed that 89% of Metro Vancouverites feel traffic delays are the main source of frustration when it comes to getting around the region. If we do nothing, traffic congestion will limit our region’s potential for economic growth and have an increasingly negative impact on our quality of life and the health of our environment. Aren't we already paying for transportation in the region? Mobility pricing is already in place in Metro Vancouver and includes things like fuel taxes, transit fares, and the recently removed bridge tolls. The money we pay supports transit staff wages, keeps our roads and bridges in a safe state of repair, and pays to expand our transportation system. Unfortunately, the way pricing has been structured in the region isn’t actually addressing congestion where it’s most needed, wasn’t always fair, and isn’t generating the revenue we need to upgrade and maintain our transportation system. That’s why the It’s Time project will explore whether there might be a better, fairer way to pay for our transportation system – a way that might also include other benefits, like better accessibility, less congestion and cleaner air. By examining how decongestion charging can be used to improve our transportation system, the It’s Time project is an important first step in creating an approach to mobility pricing that meets the unique needs of our region. If the Commission recommends one of the two decongestion charging approaches, will the recommendations also include removing certain ways we already pay for mobility pricing in the region? The It’s Time project team is still in the process of researching what is possible and how one mobility pricing approach would affect ones currently in place. We are trying to understand which policies could work well in tandem, and which ones could be phased out and replaced. As we continue with our research we will be able to see what makes the most sense based on the realities and needs of Metro Vancouver. ​​​​Does this mean that bridge tolls might be reinstated? We understand that the issue of tolls is a hot topic right now, but it’s important to keep in mind that all options are on the table for consideration in this study. And it’s important that we investigate the range of solutions that could be introduced to deal with the problem of traffic congestion in this region. The It’s Time project team evaluated 10 approaches and narrowed down to two approaches that have the greatest potential for further study. One of these is congestion point charges, which includes a range of options including tolls. You will notice in our information package that we are also looking into other options for congestion point charging beyond tolls, such as for certain areas or congested roadways. As the It’s Time project team launches the next phase of engagement, we want people to know that we’ve heard concerns about affordability and this phase will give them an opportunity to provide their input. We are currently looking at ways people might pay differently for transportation – not necessarily that they would pay more. The Commission understands that affordability is a real concern, and it’s an issue we are certainly aware of and will be addressing in our April report. Equity implications are being considered, including ideas such as discounts or exemptions for those who have lower income. The real opportunity with mobility pricing is to manage demand for the limited space on our roads. What if we could encourage just enough drivers to change the way they travel so that everyone can get where they need to go a bit faster? That’s how mobility pricing has worked in other cities, so it’s worth studying whether it could work here in Metro Vancouver. ​​​How could decongestion charging impact people and communities with fewer transportation options? ​As the It’s Time project team launches the next phase of engagement, we want people to know that we’ve heard concerns about the different levels of access to transportation options across Metro Vancouver. TransLink and the Mayors’ Council are in the process of securing funding for phase two of the 10-Year Vision which includes a significant increase in transit across the region. Revenues from decongestion charging are not part of that plan, but could be used to fund future transportation investment or reduce other costs of transportation. Improvements to the region’s transit accessibility will be important whether or not decongestion charging is introduced. The real opportunity with mobility pricing is to manage demand for the limited space on our roads. What if we could encourage just enough drivers to change the way they travel so that everyone can get where they need to go a bit faster? That’s how mobility pricing has worked in other cities, so it’s worth studying whether it could work here in Metro Vancouver. ​​Some people claim that a road pricing system in Metro Vancouver could cost as much as $20 or even $40 per day for drivers, based on fees in some other cities. Is this true? It isn’t accurate to look at what people pay in other cities and suggest that’s what will happen here. There is no one-size-fits-all solution, and a system for Metro Vancouver would be designed to address our region’s unique congestion challenges, and with equity and affordability in mind. Around the world, pricing for road usage – as well as for transit and other transportation services – varies considerably depending on the jurisdiction and the way each system works. London, England is one of the most expensive charges. Drivers entering a small area of central London pay just under $20 per day, and a few thousand drivers with the oldest most polluting vehicles pay an additional “toxicity charge” that brings the total to just over $35. Drivers in Milan pay $7.50 per day to drive downtown – people who live downtown pay $3. Drivers entering the central parts of Stockholm pay between $1.70 in the off-peak and $5.30 in the peak hour. In all three cities there is no charge at night-times or on the weekends. The Mobility Pricing Independent Commission will be reporting on policy considerations for decongestion charging, but further analysis will be needed to determine how much might be appropriate to charge for road use. Identifying dollar amounts is not within the mandate of our current research project, however we are taking into account concerns around equity and affordability, and this will be reflected in our report in the spring. The It’s Time project team studied decongestion charging in Stockholm, Bergen, Oslo and London, which shows that public acceptance is usually low before implementation and increases once charging is in place and traffic eases. Every region is different and will have its own unique experience, but understanding the challenges and opportunities faced by other jurisdictions that have implemented decongestion charging is important as we determine different policy options. The policy tools considered for Metro Vancouver will undergo further analysis and we will be looking to elected officials, stakeholders and the public in the coming weeks for feedback. Distance-based charges varying by time and location (meaning that some locations and times could have a higher $/km charge at busy times of day). ​How did the It’s Time project team decide on these different variations? We have created maps and descriptions that illustrate several different examples of the two approaches we’re studying: congestion point charges, and distance-based charges. These are based on ways that other jurisdictions have implemented decongestion charging, and also on some ideas and suggestions we heard during the fall 2017 engagement. On January 31, 2018 we began seeking further feedback from local and regional stakeholders to understand what might happen if we were to use these different policy tools in different ways in Metro Vancouver. From February 22 to March 14 we will be asking those who live, work or go to school in Metro Vancouver to share their feedback on the examples. Are the approaches outlined in the information package final? The examples of decongestion charging approaches that we’re sharing with stakeholders and the public in this next phase of engagement are not final proposals recommended by the Commission. The information is intended for discussion purposes, and to demonstrate how decongestion charging could work in Metro Vancouver. Starting February 22, we’ll have information about each of the examples and a set of questions available through our website where people can review the examples and give us their feedback. We have more work ahead of us to fully explore and analyze the examples, and public and stakeholder feedback will play an important role in shaping the Commission’s recommendations. Some commuters can’t change the time of day they drive to work. How do you envision congestion being reduced if the average person has to be at work at the same time every day? Not everyone who is travelling in the peak is going to and from work and not every traveler needs to change their behavior for decongestion charging to have an effect. Quite the contrary; it only takes a few commuters with more flexible schedules to change how and when they get to work for congestion to be reduced. ​What is the Mobility Pricing Independent Commission? The Mobility Pricing Independent Commission is a group of 14 representatives from across Metro Vancouver who have been tasked with making recommendations about decongestion charging in Metro Vancouver to the Mayors’ Council on Regional Transportation and the TransLink Board of Directors. Although Commission members are affiliated with a variety of organizations, they are participating in the Commission as private citizens. ​What is the It's Time project trying to achieve? ​How does the It's Time project fit with transportation planning in the region? The Mayors’ Council developed a 10-Year Vision for Metro Vancouver Transportation that outlines different ways of reducing congestion across the region. The vision commits to studying mobility pricing, which includes decongestion charging, as a way of improving transportation in Metro Vancouver. ​​Is this a TransLink project? ​What does the It's Time project involve? ​​​​​How will public input be considered? ​In addition to the public, the It’s Time project team is gathering input from local and regional stakeholders, as well as a User Advisory Panel that includes representatives that are culturally and geographically diverse. We are also seeking strategic advice from an international peer advisory panel. This input is combined with technical research and analysis on decongestion charging approaches for the region. Together, the results from our engagement and research work will help shape recommendations regarding decongestion charging that meets the unique needs of our growing region. The Commission is expected to deliver its recommendations, which will reflect local values and priorities, to the Mayors’ Council on Regional Transportation and the TransLink Board of Directors in spring 2018. It’s important to keep in mind that the research we’re doing now is just the first step in a multi-year process to study how mobility pricing could be implemented. Ultimately, it will be up to the Mayors’ Council and TransLink Board, as well as the provincial government. Those decisions are still a long way off. For the next phase of the It’s Time project, we have new information about specific decongestion charging examples to share with the public. Our online survey will run from February 22 to March 14. There will be some open-ended questions, allowing you to provide feedback more freely. Public meetings will provide residents with an opportunity to speak with the It’s Time project team and members of the Commission directly. Meeting details will be posted online at www.itstimemv.ca over the coming weeks. All of this feedback will be considered as we develop our final report. It’s important to keep in mind that our report will provide recommendations to the Mayors’ Council and TransLink Board, and they will make any decisions about implementation of decongestion charging. Who is being engaged in the It’s Time project? Regional stakeholders bring a region-wide perspective to the table. These stakeholders include organizations that work across Metro Vancouver. For example, BC Trucking Association, BC Poverty Reduction Coalition, HandyDART Riders’ Alliance, HUB Cycling and the Lower Mainland Transportation Table would be considered regional stakeholders. Approximately 120 regional stakeholders were invited to participate in a workshop held in late October 2017. Local stakeholders bring a municipality-specific perspective to the table. These stakeholders include individuals and organizations concerned with a specific municipality within Metro Vancouver, but not necessarily the entire region. For example, the Delta Chamber of Commerce, Maple Ridge Active Transportation Advisory Committee, MODO car coop, Douglas College Students’ Union and South Burnaby Neighbourhood House would be considered local stakeholders. Approximately 300 local stakeholders were invited to participate in workshops held in early November 2017. Interested in being involved in upcoming workshops? Email us at project.team@itstimemv.ca. The User Advisory Panel is a representative group of citizens who will provide ongoing guidance and advice to the Mobility Pricing Independent Commission. A third-party recruiting firm helped to develop this group to ensure its membership is representative of the Metro Vancouver population. The Peer Advisory Panel consists of three groups of experts. First, people who have implemented decongestion charging in other cities around the globe, such as senior policy makers from London and Singapore. Second, people who have studied decongestion charging in North American cities and states, for example in San Francisco Washington and Oregon. Finally, academics who have studied decongestion charging in Canadian cities. Members of the Peer Advisory Panel will provide a peer review of the project research.